Abbey Road Institute is an educational initiative from Abbey Road Studios. Launched in London in September 2015, it now has schools in Melbourne, Paris, Amsterdam, Frankfurt and Berlin, all offering intensive one year programmes in audio engineering and acoustics, music theory and production, and music management. The courses harness the skills and expertise developed over 85 years within the legendary Abbey Road Studios. Building on an existing brand identity, we helped the Institute to devise a recruitment campaign to turn the heads (and prick up the ears) of potential students. 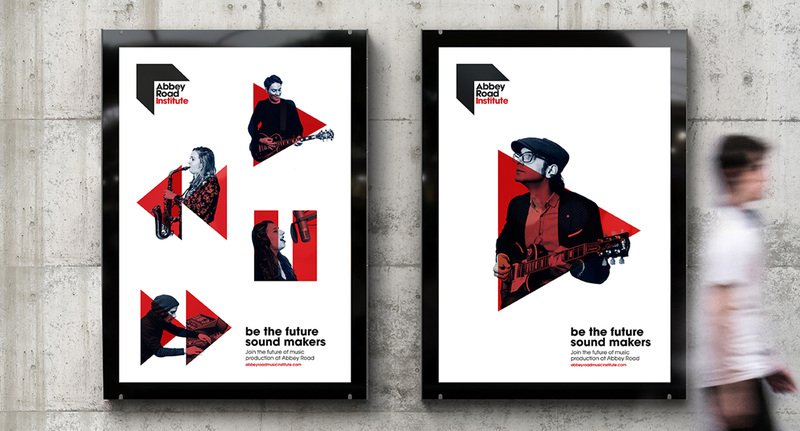 Devising a central campaign concept – Be the future sound makers – we then created a suite of flexible icons, campaign copy, a graphic system, and a series of portrait photographs shot by the brilliant Sony World Photography winner Alys Tomlinson. We hope you agree that the end result is sound design. Our campaign identity launched across all of Abbey Road Institute’s territories in 2018, reaching an audience of potential applicants in London, Melbourne, Paris, Amsterdam, Frankfurt and Berlin. It’s not often you’re invited to take a look behind the scenes at a world-famous cultural landmark. So special thanks to Hannah Fitzgerald, not only for inviting us to deliver this exciting project, but also for giving us a rare insight into the beating heart of the music industry.